Having practiced law for 28 years, Jeff Hensley of Hensley Law Office offers legal advice to clients in Russell, Kentucky, for a wide range of matters, including personal injury and family law. As the firm's principal attorney, Jeff draws from his extensive trial experience in the region to customize legal strategies that promote favorable results. Having argued cases throughout Boyd, Greenup, Carter, Rowan, Lawrence, Lewis and Elliott counties, Jeff is familiar with the dynamic present in each courthouse. He tailors his legal approach accordingly so that you can benefit from his adept handling of your case. In addition, Jeff’s knowledge of trial procedures allows him to efficiently navigate the complex legal processes that characterize Kentucky’s courts. Due to his comprehensive understanding of legal procedures, Jeff settles many cases out of court, greatly reducing the time and money typically spent throughout the course of proceedings. As such, you will spend less time concerned with your legal issue and more time celebrating its resolution. Complimenting Jeff’s depth of legal experience is the breadth of legal matters he handles. His record of success in securing satisfactory results is a testament to his commitment to obtaining justice for his clients. 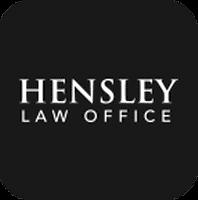 Contact Hensley Law Office today for a free, confidential consultation with a seasoned lawyer. During the course of this meeting, you can tell Jeff your story and he will advise you on your options.